Explanatory captions on this video are only visible if you watch on a computer and not on a mobile device. We've owned an Xtracycle Freeradical since 2003. Attached to a fairly basic mountain bike, it's done a lot of work in the past. However, for the last two years, our Xtracycle had fallen out of use. We both had become used to the comfort of Dutch town bikes, and as a result, we were more likely to pile parcels high on our town bikes, sometimes pulling a trailer as well, than to ride the Xtracycle. When I rode it last December, I noticed that the chain was worn and several things felt a little unpleasant, so work needed to be done. Recently the sales in our online shop have built up and the option of moving all our parcels on the normal town bike had become quite unworkable. We needed a cargo bike again. Over the last few weeks I've done quite a few small jobs on the Xtracycle to get it in usable order once more. Fundamentally, much of what was "wrong" with our Xtracycle came down to it being a mountain bike with a thing bolted onto the back. Now I know that many people love their mountain bikes. There is no reason why they should not do so. Mountain biking is a fine sport. The problem isn't mountain bikes, or their riders, but the use of the wrong tool for the job. Mountain bikes are not particularly practical bicycles. MTB gearing is rather on the low side, which is fine for travelling through mud or up steep slopes, but not ideal around town. The sitting position is uncomfortably stretched out due to the long stem and straight handlebars. The high bottom bracket, useful when riding off-road, is a nuisance in town as it requires that one hops down off the saddle at stops. MTBs don't come with mudguards, chainguards or racks, which can be tricky to fit. A kickstand isn't fitted, and permanent fitting of lights is not straightforward. A practical bike needs to have nothing on it which must remove when you park. Many of the problems with using a mountain bike for everyday transport can be solved with suitable add-ons, and by doing this one can approach the concept of a practical Dutch everyday bike, which comes fitted with everything you need for practical use without requiring work to be done. Some of the issues are tackled by the Xtracycle Freeradical add-on itself. It provides an oversized rack. If you also fit the Xtracycle specific kickstand then that solves another problem as the bike can now stand upright without assistance. These two things we'd already done. However, the problems that remained with our Xtracycle were typical "MTB as town bike" problems, which have now been put to rest as well as possible. For a start, the tyres. Knobbly tyres are designed for mud. They're also OK in snow. However (with just a few exceptions) they are inefficient and slow on smooth surfaces. Also, cheaper tyres are puncture prone. There are various add-on products available to try to reduce this problem, but far and away the most effective way of reducing the problem of punctures is to fit better quality tyres with a good anti-puncture layer. I chose the Schwalbe Marathon tyre. It's not fast like a racing tyre, but it's faster than typical knobbly tyres, and puncture resistance is very good. This also makes the bike blissfully quieter to ride as you don't get the characteristic hum of a knobbly tyre on tarmac. While on the subject of wheels, another essential for everyday riding is to fit mudguards (fenders). Because I don't like spray on my feet and shoes, I also fitted the larger and truly effective type of mudflap. Only half a mudguard is fitted at the back. Sadly, my original model Freeradical had no really good way of mounting a rear mudguard. 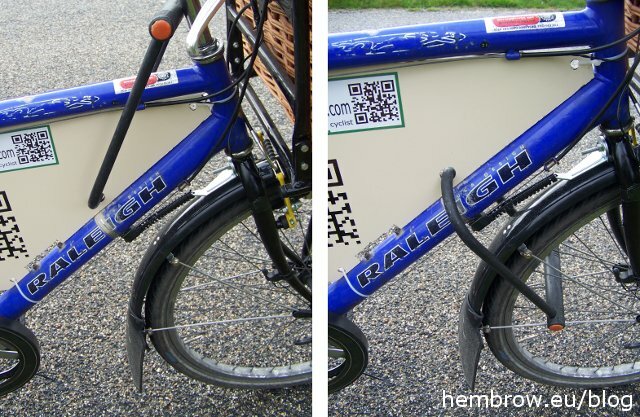 I understand that eyes for mounting a mudguard are provided on newer versions of the product. To achieve more comfort when riding the bike required changing the handlebar and stem and also the saddle. My handlebar and stem are a set which we already owned which is equivalent to the combined handlebar and stem in the webshop. This change brings the handlebars a lot closer so that we don't have to lean over so much when riding and the cargo is closer to the turning axis, so the bike is easier to control when heavy. Also, the ends of the bars turn backwards, which is much more comfortable for the wrists than a straight handlebar. The saddle is the same wide sprung and comfortable model as we'd already got on other bikes of ours, and as used by so many people who want comfort and practicality. Our Xtracycle is fitted with a Steco front rack for extra capacity. This works very well, but it also makes the steering more likely to flop around when the bike is on its stand. For that reason I have fitted a steering damper to the bike. I'd not used one before, but I find that it works very well with the rack. The handlebars no longer turn so much when the bike is parked, and so weight in the front is less likely to flip the whole thing over. It also has a benefit when riding as it tames the front end a little, which is helpful when there is a lot of weight on the rack. I've also fitted dynamo lights to our Xtracycle. They've a huge advantage over battery lights in that they are permanent, bolted on, part of the bike so don't have to be removed when you park and there are no batteries to be flat. This is essential for practicality. I'm using a Nordlicht dynamo attached with a special bracket for the V-brake boss, coupled with a Basta headlight mounted on the light bracket built into the Steco rack. There are brighter headlights for use on long rides in the countryside, but that's not what we use our Xtracycle for. For use in town, this provides more than enough light for a very reasonable price. The rear light is difficult with the Xtracycle. Again, there is no good place to attach a light to the Freeradical frame. I've opted for a DIY solution using an old battery-powered rear LED light adapted for dynamo use and attached to the bottom of my saddle. I would have liked to fit a Dutch style lock to the bike. These are by far the most convenient and quick to use style of bike lock, but they don't fit with the Freeradical in place. Instead, I found a way of mounting an old D lock permanently on the bike. A hole drilled in the advertising board allows the D lock to be swung into the wheel. It also stays in place above the top tube while riding. It's not the highest security arrangement, but it's enough around here. The triple crankset (22/32/42 teeth) which was originally fitted to the mountain bike which we used as a donor has been replaced with a single speed crankset with 46 teeth. This gives higher gears for a bit more speed in town. Finally, a bell. Of course, for a large bike there is just one choice - the 80 mm Ding Dong bell. And how has it turned out ? Well, now the bike is once again enjoyable to ride, and over the last few weeks since the work was done, it's been used several times. Would it be possible to mount a wheel lock (AXA victory) on the front wheel just behind the fork? Generally speaking, it's possible to mount one of those locks on the front wheel. I've seen it done. There is a mechanism which is designed to prevent the lock from moving when the key is in it, but I think the manufacturer really recommends the locks to be mounted on the rear wheel.